During the development for the Heat Sink Calculator the values calculated for a heat sink cooled via natural convection and radiation were compared against experimental data from work done by Yazicioglu  and Kharche et al . The orientations of the base of the heat sinks investigated are shown below. The experimental data for heat sinks under going natural convection/radiation with the base in the vertical orientation is provided by Yazicioglu  . 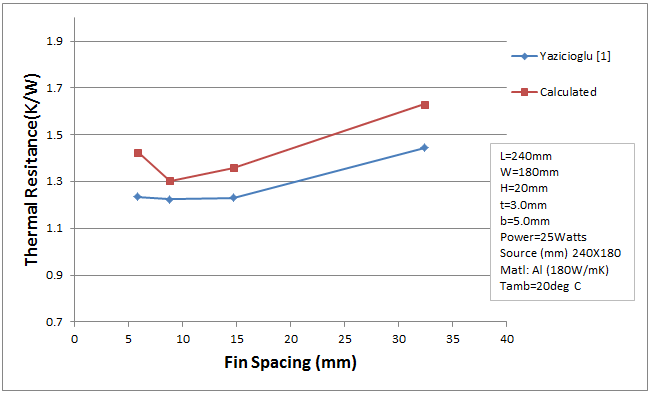 The graph below shows a comparison of the experimental data from Yazicioglu  with results obtained from the Heat Sink Calculator for various fin spacings. 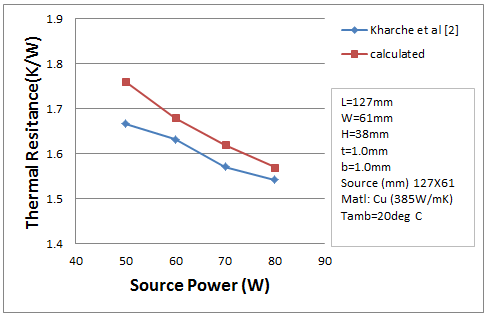 Similarly the experimental data for a heat sink undergoing natural convection/radiation with the base in the horizontal orientation are compared against results from the Heat Sink Calculator in the graph below. In this case the heat source power input is varied and the heat sink dimensional parameters are kept constant. The experimental data are obtained from the work done by Kharche et al . The calculated results are within 12% RMS and 4% RMS for the base oriented in the vertical and horizontal orientations respectively.